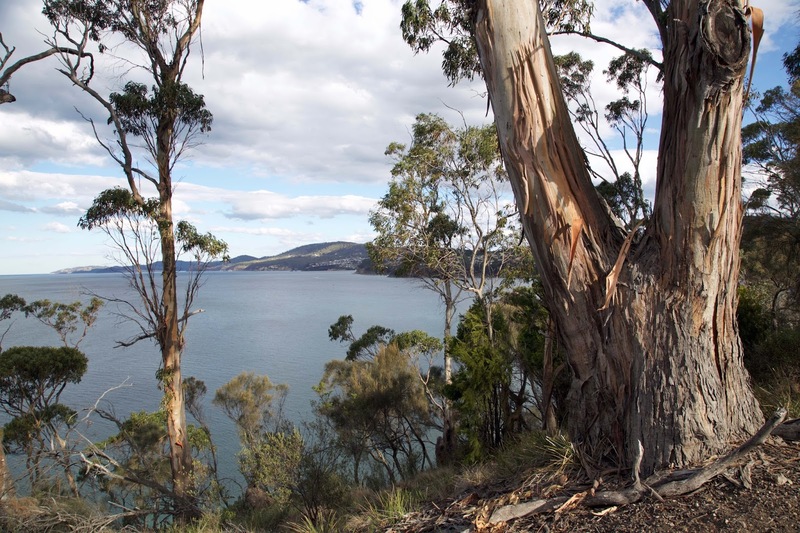 What’s the best direction to walk the Alum Cliffs Track along the Derwent? That’s what I was wondering when a fine afternoon seemed to invite me to try the walk for the first time. As I was doing it by myself, a neat solution occurred. I could walk it both ways! That would not only solve the transport issue, it’d give me twice the walk distance. That sorted I drove to the end of Taronga Road in Bonnet Hill, not far past Taroona’s Shot Tower. 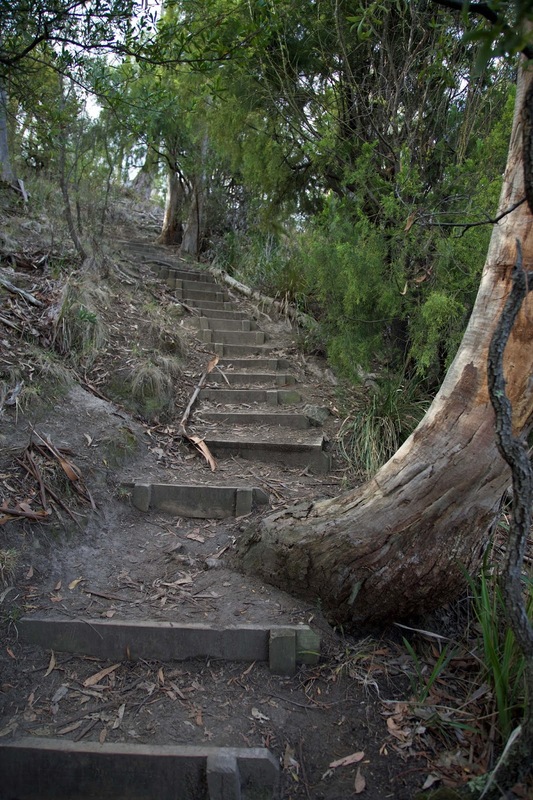 The track here is around 100m above sea level, and it wasn’t long before I was getting glimpses of the Derwent between the trees. 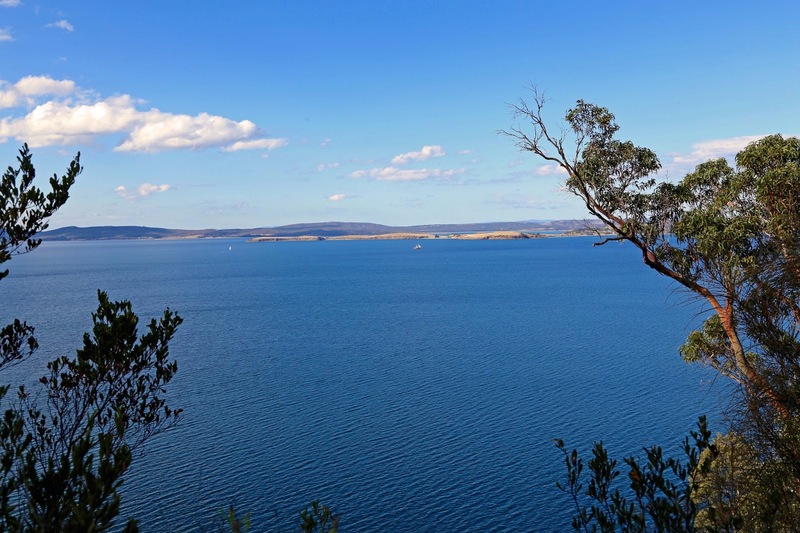 After about a kilometre of easy undulating walking, the glimpses turned into a full-blown view. From a cleared and fenced lookout I was looking straight across the beautiful, broad Derwent estuary towards South Arm. An old tall ship, a modern yacht and a cargo vessel slipped slowly past, reminders of the continuing maritime story of the Derwent. 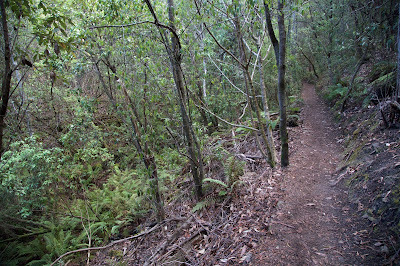 The track wound up and down, weaving inland through damper gullies before returning to the drier cliff tops. At various points fences protect unwary walkers from the steep cliffs that give the area their name. The “Alum” part of the name derives from the alum compound that was found in the local rocks. The track was now trending downhill as it curved south-west towards Kingston. I tried to ignore the fact that my return trip would be mostly uphill. The views were a good distraction, with a large part of the Derwent estuary and Storm Bay stretching out before me. 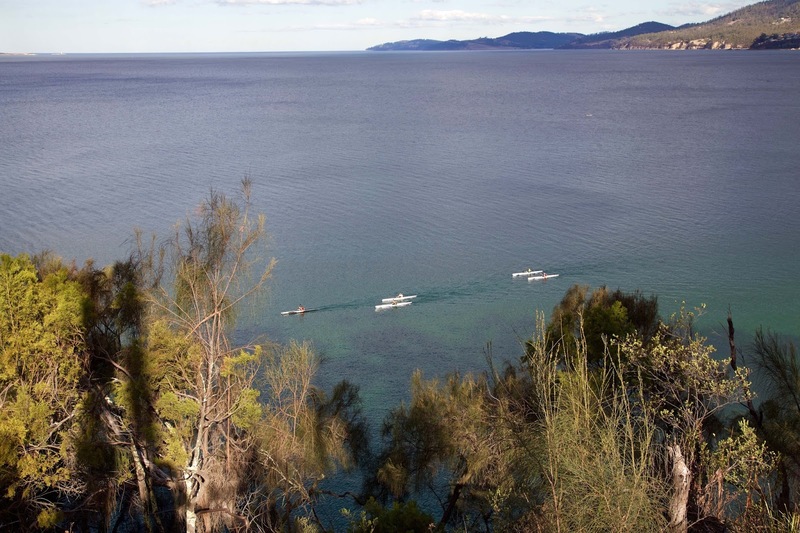 Below a group of sea kayakers hugged the shore, heading towards the cliffs. Above the dog beach I again had a choice. 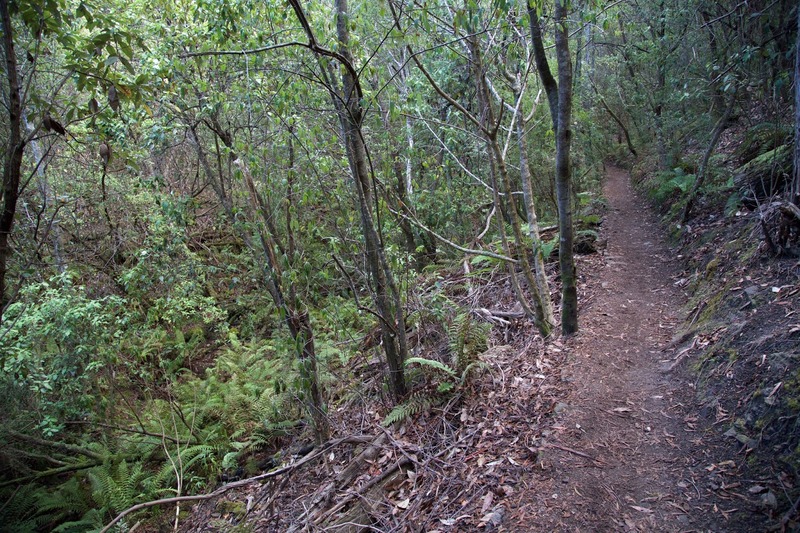 One steep track wound down to the beach, while another more evenly graded track lead to Tyndall Rd carpark, and Browns River. 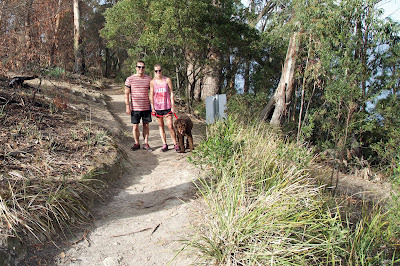 I took the steep track down to the beach, where a good number of humans and dogs seemed to be having some relaxing fun. But for me it was time to turn around, and do the walk in reverse. In total the walk there and back was just shy of 6km, and it had taken less than 2 hours. And which direction did I prefer doing the walk? To be honest each direction has its attractions, and I’d probably do the same again. But if I was walking with children or a group with mixed abilities, I’d be inclined to leave cars at both ends, and do the one-way, mainly downhill walk from Bonnet Hill to Tyndall Beach. 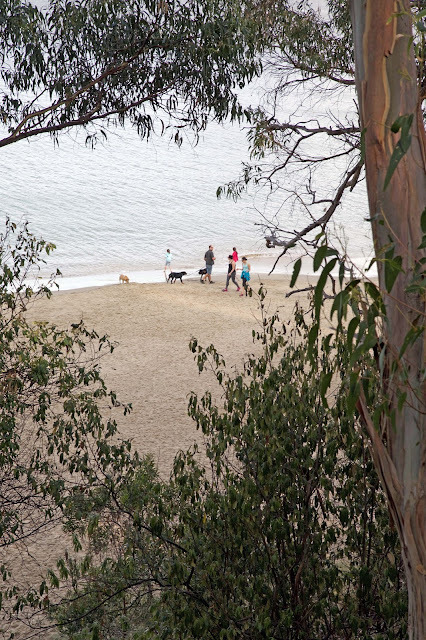 If that wasn’t enough, a walk along Kingston Beach – with a café stop and a swim – or an even a longer walk on the Boronia Beach Track, would be good add-ons. “Worse than yesterday” never came. Instead we wake to another dreich, damp Waterfall Valley day. Barn Bluff is playing hide and seek with us, as fresh clouds swirl around the heights, dropping a few careless showers. 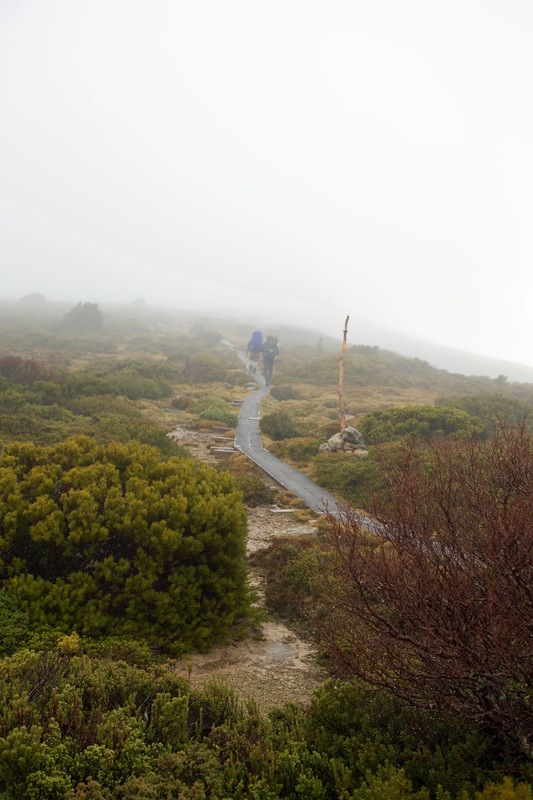 It’s what you’d expect of winter on the Overland Track, really. As opposed to what we’d experienced, and what had been forecast. 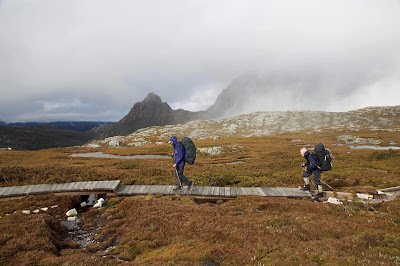 Some of our hut mates are keen to keep walking south, and face whatever befalls them. They include Melbourne-based Lee, and German couple Manuel and Julia. And suddenly, over breakfast, Mick tells us it includes him too. We’re not greatly surprised. He’s got friends coming in to meet him at the other end of the Overland Track. They plan to then walk back into Pine Valley. Rather than have to rearrange everything, it’s simplest if Mick sticks to the original plan. 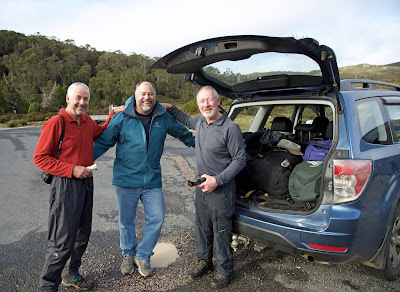 And this way, hopefully, he’ll also achieve his first complete Overland Track trip. We feel strangely parental farewelling Mick, first foisting a tent and then a personal locator beacon on him, “just in case”. I resist checking whether he’s got a hanky. And then we walk our separate ways, Mick and friends to the south, ourselves to the north. Leaving the valley, we ascend into the cloud that licks the rim of Bluff Cirque. It is moist though not rainy, and we debate whether rain gear is necessary. Despite feeling like a cooked lobster, I exercise the precautionary principle and leave mine on. 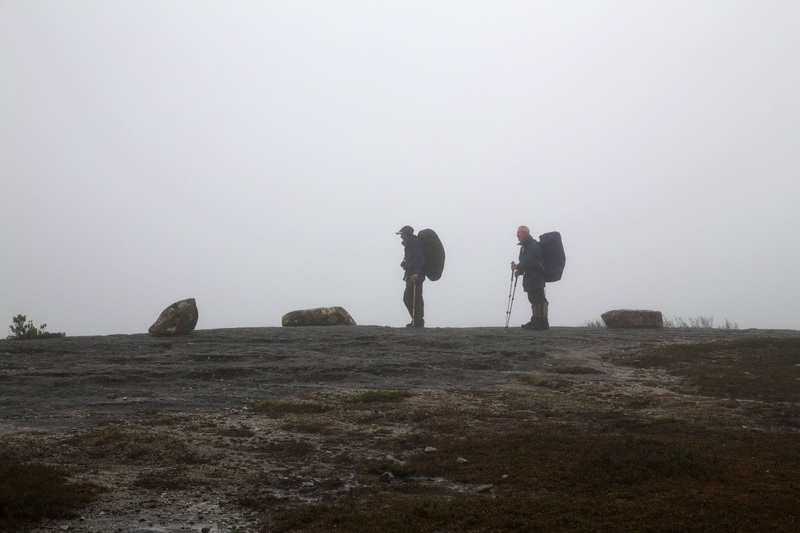 We walk through thinning cloud most of the way back, catching occasional glimpses of valleys and mountains, and even the odd patch of blue sky. The track is still wet, or what we would once have called wet. In comparison with our walk in, it’s luxurious. Kitchen Hut feels that way too. When the sun threatens to break through, we even consider digging out our sunglasses. 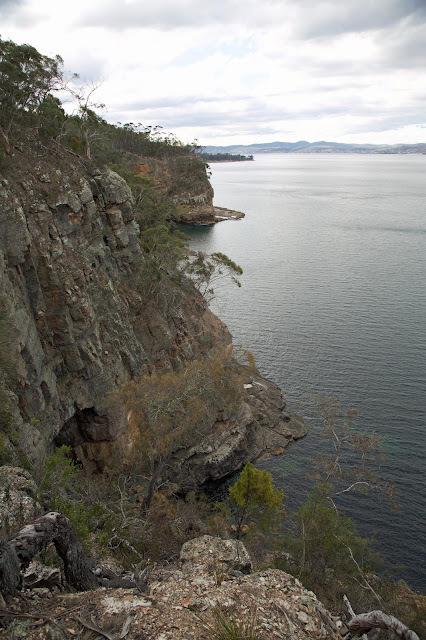 By the time we’re approaching Marions Lookout, we’re getting real views again. And when we get mobile reception and can ring Tim D., the weather is as cheerful as his news. He’s on target to meet us at Ronny Creek around 2pm. I’m not sure Tim is used to the kind of reception we give him, unless it’s from his dog. And then, like a pack of dogs, we’re busy exchanging news, talking nineteen to the dozen. We quickly find out how serious and widespread “our” weather event has been. Tim tells us three people are missing, presumed drowned, in the floods. And hundreds of cattle have been washed away, as towns like Latrobe and Longford have gone under. On the drive down to Sheffield, where Tim and Merran have kindly offered us a bed for the night, we start to see the flood damage firsthand. We detour around some flooded sections; see numerous fallen trees; and ease past sections where road verges have slumped seriously. Our experience has been mild in comparison, though we soon find that Facebook has told it otherwise. News of our “rescue” from the flooded Overland Track has already hit our fb feed. It seems many people have been quite worried about us, so we quickly reassure them. Our “rescue” gets very fancy when, after a blissfully hot shower, Tim and Merran break out cheese and wine as a pre-dinner treat. And it feels complete when Tim fires up his pizza oven, and he and Merran deliver an abundance of perfect home-made treats. Eventually, when we can’t eat another thing, and all our tales have been told (a few times), we retire, each to his own soft bed. And if that isn’t bliss enough, there is no snoring to be heard! Postcript: What became of Mick? 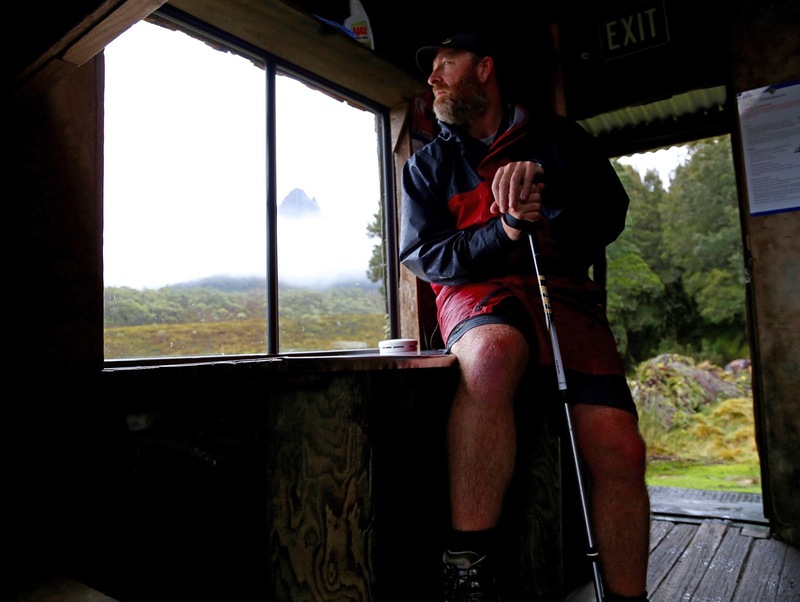 At New Pelion he caught up with Lee, and reunited him with the torch he’d left in Waterfall Valley Hut. 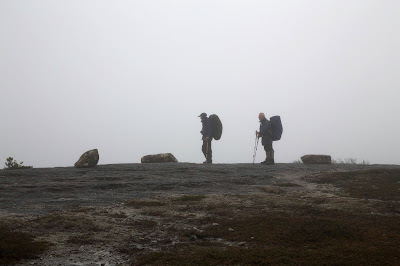 Mick and Lee then walked on together over Pelion Gap to Kia Ora, choosing not to climb Mt Ossa in cloudy, showery conditions. The highlight of the next day was the “incredible sight” of a flooded upper Mersey River thundering over D’Alton, Fergusson and Hartnett Falls. 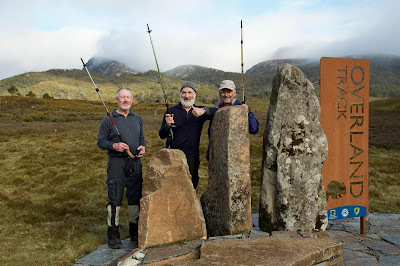 Mick’s adventures didn’t end at Narcissus, as they do for most Overland Track walkers. Instead he picked up a resupply that had been ferried in by friends. 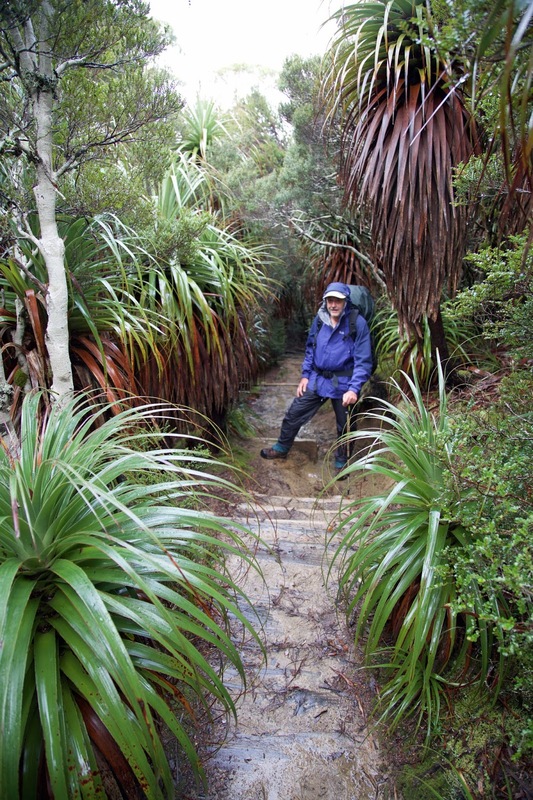 Together they headed back up to Pine Valley, along with Lee, Manuel, Julia and other walkers he’d met on the main track. To top it all off it snowed at Pine Valley, with three inches at the hut, and nearly double that up on the Labyrinth. He had what he described as “a fantastic day of wandering in my favourite winter wonderland”. Eventually even heroes have to come home, and Mick did so with “lots of mixed feelings. I dawdled behind the others for most of (the walk out). I wasn’t looking forward to ending what had been a pretty amazing 9 days…”. There’s always next time Mick!